Steinbach in 1996 decided to begin a new series of nutcrackers only for members of the Steinbach Collector’s Club. 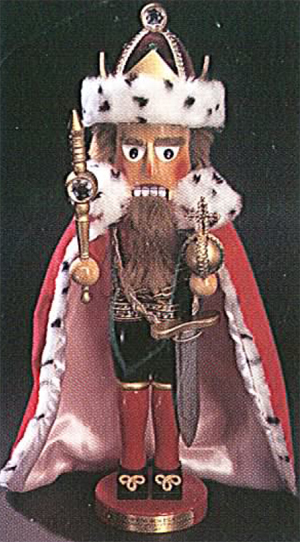 The first nutcracker to be released into this exclusive membership was the Good King Wenceslaus. This nutcracker is based on the popular Christmas carol that tells of a king, King Wenceslaus, who gave out alms to a poor peasant on the Feast of Steven which, is the second day of Christmas, December 26. During Wenceslaus’ journey his page is ready to give up the struggle against the cold weather, but is able to continue from the warmth miraculously being given off by the king’s footprints in the snow. This legend is based on the historical Saint Wenceslaus I, Duke of Bohemia. Although it is unknown the exact number of nutcrackers offered for this limited edition piece it is averaged to be less than 7,500, which makes this nutcracker one of the smallest amounts ever sold and produced. The second nutcracker to be released into the Steinbach Member’s Only Nutcracker Series was Marek, the Royal Guardsman. In the age-old tradition of royalty, the “Good King Wenceslaus” was never without his faithful guard by his side. In 1997 Steinbach was pound to introduce Marek. This nutcracker stands at 17 and ½ inches tall. He bravely protects the King from any and all harm. The Royal Guardsman is dressed appropriately as the “right hand man” of the king. He proudly wears his bright uniform, and his armbands signify his accomplishments as a loyal, strong and fearless soldier. His mace and halberd are as fierce as he is, and are typical of the weapons used in medieval times. The way to a King’s heart is through his stomach, as they say. The Good King Wenceslaus would be desperate without his jolly cook by his side. The cook held a very important position in society as the provider and source of nourishment for the king. 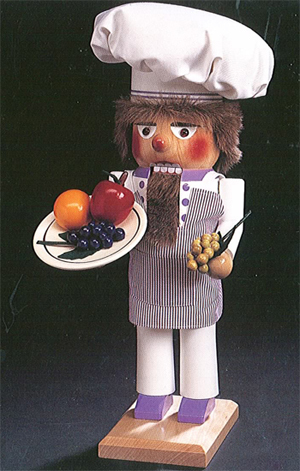 In 1998 the Steinbach Member’s Only Nutcracker Series was pleased to introduce Gustav, the Royal Cook (ES1824). He stands at 17 and ½ inches tall and serves a feast for his noble king. The Royal Cook nutcracker is a plump and merry fellow who delights and satisfies the king with his culinary treats. Whether it is a sumptuous roast or a plate of luscious sweets, Gustav caters to all the king’s dietary pleasures. Holding a plate dripping with succulent fruits in one hand and sporting a puffy white hat, Gustav serves his meals with pride. In the tradition of nutcracker collecting Steinbach continued the exclusive Steinbach Member’s Only Nutcracker Series in 1999 with the introduction of Otto, the Royal Drummer. Hear Ye! Hear Ye! Make way for the King!!! Otto, the Royal Drummer leads the royal procession through the streets and “drums out” the news of the land. Dressed in a faux-fur hat and regal velvet uniform with gilded epaulets, Otto proudly announces the approach of the king. During the 1400’s, the king’s royal parade through the streets of the town was the highlight of the day during which, the villagers learned the news of the land. The “drummer” not only announced the approach of the king, but also served as a modern day news reporter who informed the people of the local gossip and current events. As early as 1485, King Henry VII instituted the position of the “Beefeater”, a highly esteemed post as the official “bodyguard” of the king. The modern-day Beefeater still wears the red and gold Tudor uniforms and carries a pike as in earlier times. These brightly costumes were actually instituted in 1522. Also known as Yeoman waders, these colorfully dressed guards are also custodians of the Tower of London. They are most well known for their role in the Ceremony of the Keys, a 600-year old tradition that commemorates the Tower of London’s significance as a historic stronghold of Britain as well as it’s modern- day function as the museum which houses the priceless Crown Jewels. This nutcracker is an accurate portrayal of these traditional guards from the top of his decorative hat including his lace ruff and his elaborately adorned shoes. 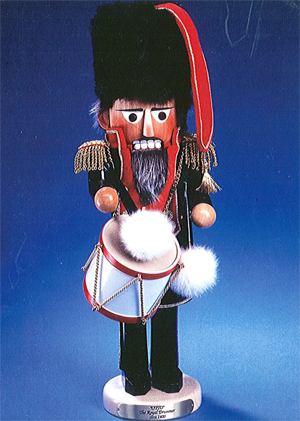 Steinbach introduced this nutcracker as the fifth member of the Steinbach Member’s Only Nutcracker Series in 2000. At the beginning of the 16th century the Vatican began to employ Swiss mercenaries, who had the reputation for faithful service. In the 1527 “Sack of Rome”, it was the quick reaction of the Swiss Guards that enabled the Pope, Clement VII, to take refuge. However, 147 Swiss soldiers died in the fighting and the invaders caused irrevocable damage to ancient manuscripts, artwork and other treasures. The costumes of the Swiss Guard with the puffed sleeves and red, blue or yellow knickers date back to Renaissance times. In 1505 the guards wore simple tunics, but in 1548 the uniforms worn at present were adopted. As well as their everyday costumes, the Swiss Guards have suits of armor with swords, but these are only used for escorting the Pope during special ceremonies in St. Peter’s. Every year on May 6th, the anniversary of the “Sack of Rome,” the Swiss Guards renew their vows. In a colorful ceremony, new recruits kneel down and raise three fingers of their right hand to symbolize the Trinity and swear allegiance to serve the Pope. 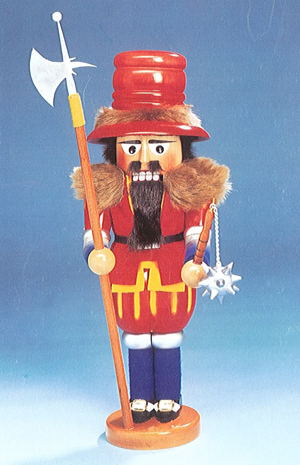 In 2001 Steinbach released the sixth member of the Steinbach Member’s Only Nutcracker Series, Guido, The Swiss Guard Nutcracker. In the years before the dawn of the 20th century, the Night Watchman was one of the many citizens responsible for the safety of the inhabitants of the walled fortified cities across Europe. The citizens who slept soundly at night trusted the Night Watchman to keep the streets inside the high stonewalls safe, but his job was dangerous because he had to guard the city at night like a policeman. The Night Watchman made his rounds from nine in the evening until three in the morning, relying on the town hall clock to tell him when to sing his “Hour Song”, which reminded the people who slumbered safe in their homes that all was well in the city. The Night Watchman’s horn or bell warned the citizens of fire, the worst possible disaster that could strike a city in the days before fire hydrants. Keeping watch over the city, lighting the lanterns and announcing the hours in the still of the night were the duties of the Night Watchman. These men patrolled cities across Europe up to the year 1920 and remain a memorable part of the historical development of towns and villages. 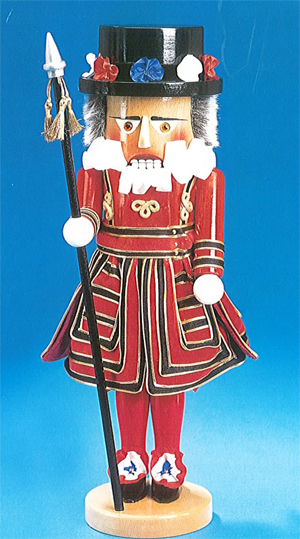 In 2002 Steinbach released the seventh member of the Steinbach Member’s Only Nutcracker Series, The Night Watchman Nutcracker. In the 20th Century, the treasurer was the most trusted person in the king’s court. He was responsible for the royalty of the king as well as the surrounding townspeople. The Schatzmeister, which is German for Treasurer for the King, was the person in charge of all the financial endeavors of the inhabitants of the walled fortified cities across Europe. The citizens trusted the Schatzmeister with all of their jewels and gold as well. Keeping tabs of the King’s welfare requires a wealth of knowledge. The Schatzmeister was usually the most intelligent person in town. The treasurer, who worked alongside the Night Watchman, had a job that lasted all hours of the day and night. He protected the King’s money from thieves. In 2003 Steinbach released the eighth member of the Steinbach Member’s Only Nutcracker Series, The Treasurer Nutcracker. 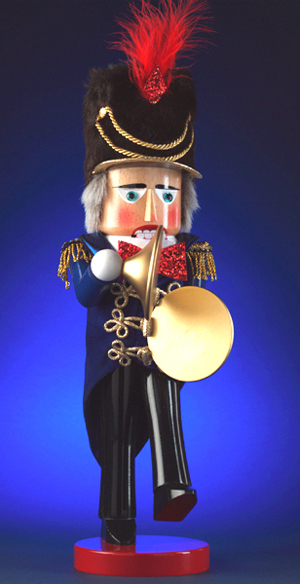 The 2004 addition for the Steinbach Member’s Only Nutcracker Series was the Ring Master (ES1798DL). Standing at 17 inches tall, the Ring Master is the ultimate front man. What we love most about the Ring Master is this ability he has to conjure the feeling of watching a parade go by with just one look. His grey hair suggests someone who is an experienced entertainer and the glimmer in his eyes proves he loves his work.